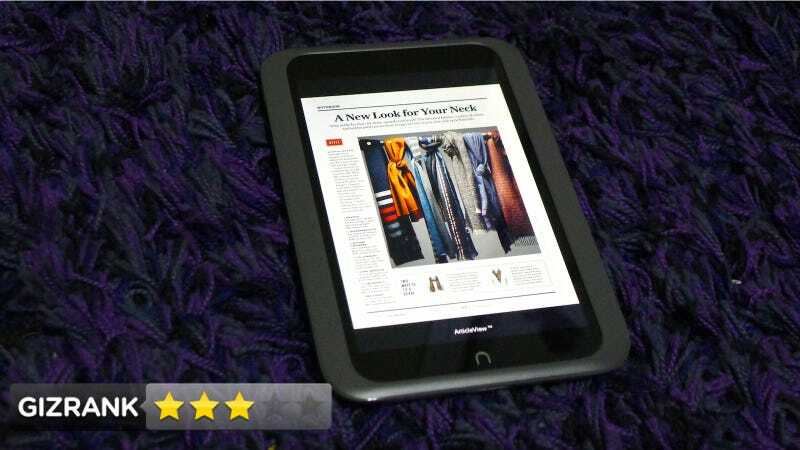 Nook HD Review: Is a Sweet Screen Enough? Small tablets abound these days, each with its own set of advantages. The Kindle Fire HD screams ease-of-use. The Nexus 7 is a speed demon. The iPad mini has a formidable ecosystem behind it. And now comes Barnes & Noble's Nook HD, making a play for your eyeballs. Note: While we tested the Nook HD with software that was "near-final, but still pre-production." There may be small changes in the final release. The new HD version of the 7-inch Nook tablet. It's Android, with a heavy Barnes & Noble skin. Avid content consumers. Especially those who have already bought a lot of ebooks, magazines, and videos from Barnes & Noble. It's very light at 11.1 ounces-the iPad mini weighs in at 10.88 oz-though it's a bit thicker than competing tablets, .09 inches more than the already slightly bulky Kindle Fire HD. The back is a bulbous soft plastic that makes it feel a little toy-like-some might say cheap-but maybe that makes it more drop-proof? The Nook HD is really just a vessel for interfacing with Barnes & Noble's content store, and then viewing that content. It has a web browser and a basic email client, and you can get more apps through Barnes & Noble's store. A note of caution: You won't have access to the full Google Play app selection. It's a curated group of apps, even more limited than the Amazon Appstore. While the Nook HD is built on Android 4.0 software, it's been redesigned to where it's almost unrecognizable. At the top of the display is your most recently viewed stuff, which is a carousel you can swipe through and interact with. There are permanent shortcuts at the bottom of the display to Library, Apps, Web, Email, and Shop, and five total desktop spaces that you can swipe between and populate with books, magazines, apps, and movies. The screen. Hellllooooooo, beautiful! Barnes and Noble really put all of its eggs in this basket. 1440x900 pixels nets you 243 pixels per inch, soundly beating everything else in the 7-inch category (the 7-inch Kindle Fire HD has 216 ppi). Magazines and graphic novels really pop and are extremely clear. Videos look good, too. Speed. Or lack thereof. Despite the fact that it's based on the same kernel as the Kindle Fire HD, it just doesn't run as smoothly. Apps don't pop open right away, scrolling stutters. It takes longer than it should to do pretty much anything. The Nook HD has two speakers. "Great!" you say. "Now my movies will be in stereo!" Not so fast. The speakers are on the corners of the shorter side of the Nook HD, which means that while they play stereo in portrait, in landscape they're side-by-side. When you watch a movie, it feels like you've gone deaf in one ear. Barnes & Noble's content library is truly impressive. The range and volume of ebooks, MP3s, and movies rivals Amazon's (and may even surpass it in some categories). You won't lack for things to buy. If only that applied to apps as well. B&N claims its offerings are just highly curated, but no, there are just so many good games and apps unaccounted for. Its options lag behind the Kindle Fire, which itself trails the Nexus 7's full Google Play access by miles. In particular-as with Kindle Fire-there are no Google apps available here. No Gmail, no Maps. You will miss them. The software is extremely inconsistent and frequently hard to navigate. Menus may be hidden anywhere. Sometimes buttons appear but don't do anything. The whole point of the UI is to make it simpler than Android, but Android has actually gotten pretty intuitive, and while there are fewer places to get lost in the Nook, it's not worth the trade-off of having fewer places to go. The Nook HD has a micro SD card slot so you can expand your storage to your heart's content. This is a significant advantage over both the Kindle Fire HD and the Nexus 7, but also a necessary one; the Nook doesn't have Amazon or Google's cloud prowess to stash all your stuff for you. The Nook HD also has a port that, when using an adapter, can connect it to your TV via HDMI, so you can stream your 1080p content on the big screen. The software makes sharing the tablet between multiple people very easy by supporting multiple profiles. It's great for letting kids access some content but not others, and is customizable. (This functionality will be built into the stock version of Android 4.2). The web browser is decent. It has a great feature called ArticleView, which basically pulls the content of a webpage you're viewing into a cleaner, easier to read document which you can save for offline view. It's like a built-in Instapaper. In our tests it was faster than the Kindle Fire HD's browser, but it gets left in the dust by the Nexus 7 both in speed and functionality. While we don't like that it's kind of thick, we do like that it's easier to hold. Good for the hand, bad for the pocket, basically. No camera on this puppy. While we don't miss the rear camera, it'd be nice to have a front-facing one for video chat. Audio on the speakers is pretty lousy. Very tinny. We found battery life to be a bit better than the Nexus 7 and a bit worse than the Kindle Fire HD. You should get about 10 hours of read time, depending on your usage.